Organic. Wheat & gluten free. Low-fat. Suitable for vegans. Vegetarian Society approved. 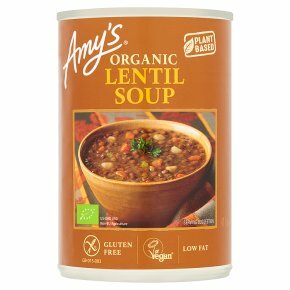 Kosher - Pareve.Amy loves this nourishing organic lentil soup made from her mum's favourite recipe. It is high in fibre, a good source of protein and has a rich, satisfying flavour. Your entire family will love it. Empty contents into saucepan and heat gently until piping hot. Stir occasionally.Please do not overcook.